BEFORE: I’m excited to try your program. I decided to enter after watching your page for years. After having a baby I want to go ahead and tighten up my body. More specifically, my abdomen area, back and thighs. Also, after the holidays, I feel and look extra bloated. I know with your program, my whole body will change. Can’t wait to see how much it changes after 21 days! 21 Days AFTER: I really enjoyed this program. 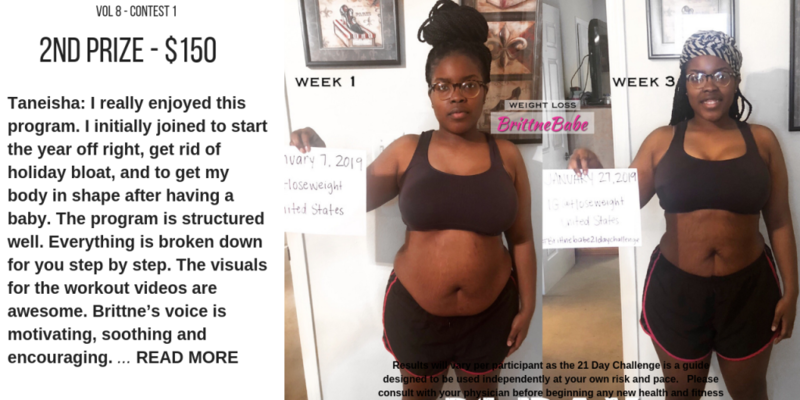 I initially joined to start the year off right, get rid of holiday bloat, and to get my body in shape after having a baby. The program is structured well. Everything is broken down for you step by step. The visuals for the workout videos are awesome. Brittne’s voice is motivating, soothing and encouraging. I like that it wasn’t like other programs that restricted your food, focused so hard on legs and pushed you hard where you burnout in the first couple of days. It was a challenge without being difficult and something that I could incorporate into my lifestyle. I enjoyed my results and am looking forward to continuing my fitness journey. Well done Brittne!